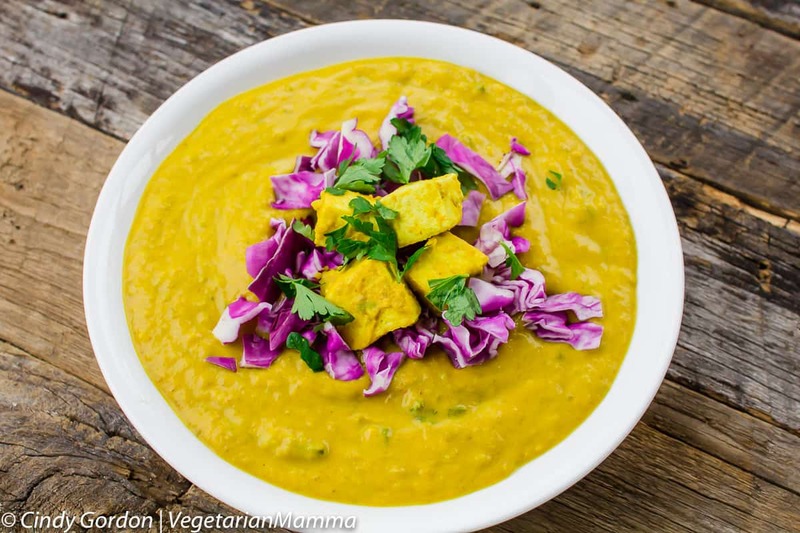 This vegetarian coconut curry soup is perfect for the weekend or a busy week night. 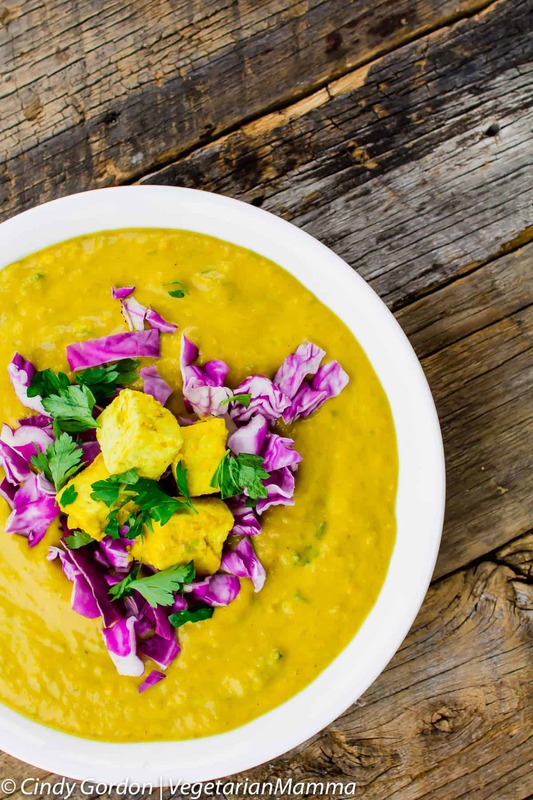 This family friendly soup curry is also gluten-free and vegan. You are going to love the tofu and Thai flavors in this soup! 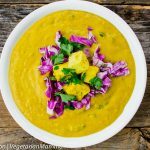 If your taste buds are adventurous like mine, you’ll want to try this Vegetarian Coconut Curry Soup. It’s a taste that honestly can’t be described fully in words. To appreciate, you have to eat to believe and understand. Thai flavors are some of the most delicious flavors that mix very well with a variety of vegetables. They can be added as a curry, or mixed in when cooking other methods to enhance and bring out that Thai flavor. Thai flavors can mean a variety of different spices. And if you ask me, each and every one of them are absolutely amazing! Many Thai dishes have complex-tasting flavors and have a couple of the five different flavors or Thai mixed into each and every dish. 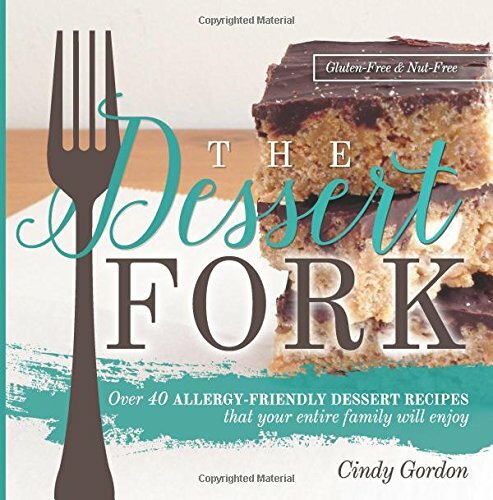 For the sweet flavor, sugar is typically the main ingredient added. Sugar makes everything taste a bit sweeter, right? The sour flavor can have lime, mango or pineapple as the ingredient to really give the dish a strong taste. Spicy in Thai flavor really brings the heat! Chilli peppers are always a top ingredient choice to add to many Thai dishes. Fish sauce is common to obtain the salty flavor while the bitterness comes from the addition of various greenery that can be found on plants, etc. Thai dishes tend to have complex flavors by combining a few of the different flavor options above in each and every dish. Whatever flavor you combine, taste test as you go! 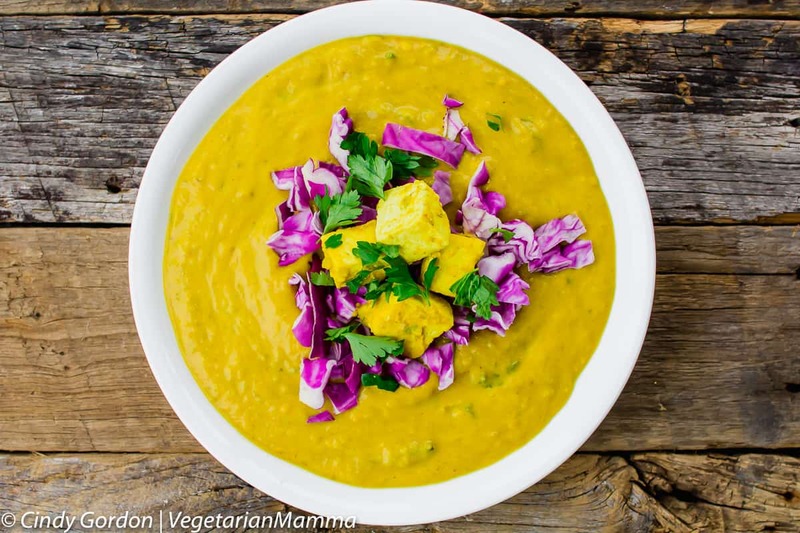 You want to make certain that your added ingredients go well together and compliment the overall flavor of the Vegetarian Coconut Curry Soup. Curry has been around for many, many years. In fact, there are reports that curry has been around for thousands of years! Talk about a flavor that’s been making taste buds dance for centuries! If you’ve never tasted curry, it can be hard to describe all the flavors that go along with it. Typical curry is made with some sort of meat and veggies, served with a side of rice. 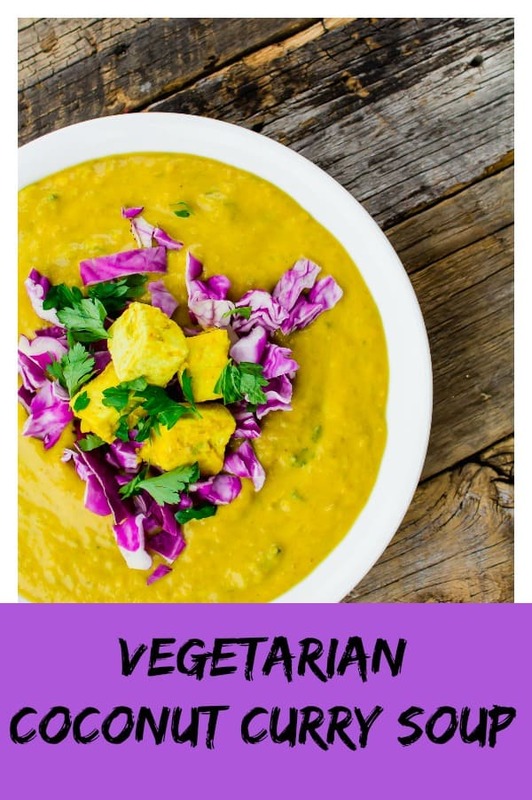 As you know, meat is a no-go in our house so that is why my curry soup recipe is vegetarian and free of meat! Curry can actually be different colors as well, depending on the ingredients used. And don’t forget about the health benefits of eating curry as well! It’s packed full of great ingredients that are good for you and your body. First and foremost, let’s address the elephant in the room…Coconut milk is not the same as coconut water! Whew, now that that’s been settled, it’s time to learn the difference between Canned Coconut Milk and Carton Coconut Milk. Not all coconut milks are created equal. When it comes to Carton Coconut Milk, reading the ingredients on the back of the carton is key! More than likely, there will be quite a few ingredients that may surprise you. Anything that has to be added that isn’t natural or organic should throw up a red flag in your mind. This milk is typically for drinking. Canned coconut milk is different than carton coconut milk, in a good way. Canned coconut milk typically is made up of very few ingredients and there are no fillers or additives added. This milk is typically for cooking. When trying to decide between canned or carton coconut milk, do your research and compare the two items side-by-side. There’s no denying the facts about the product that are listed right there on the label for you to read. I LOVE TOFU! If I could yell it from the mountain top, I would. And while tofu is good with a ton of different variety of dishes, I love how it picks up the flavor and spices of this curry soup perfectly. Did you know that there are different types of tofu? Before I started eating it, I had no idea! 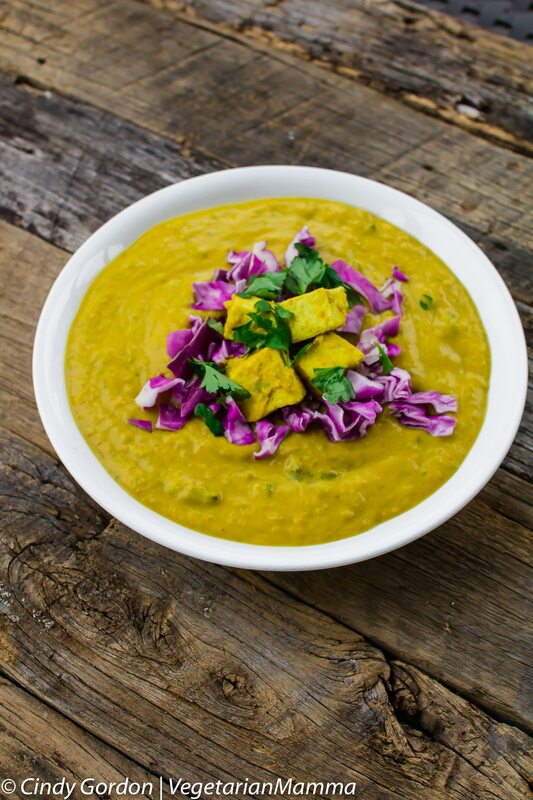 With over 5 different types of tofu, you’ll have plenty of options to add to your curry soup! Not only are there quite a few varying types of tofu, but tofu also provides some health benefits as well. It’s low in fat and a great source of protein making it a perfect addition to your soup or other Thai options. 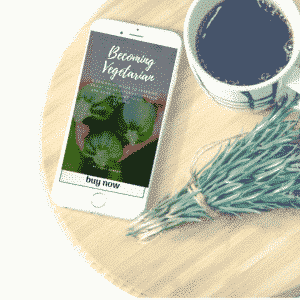 And if you’re stumped on ways to cook tofu, you’re not alone. Many people may feel as if they don’t like to eat tofu, but in all reality, they’ve never cooked it appropriately. Whether you fry, boil or bake, cooking tofu correctly is key for the best flavor! 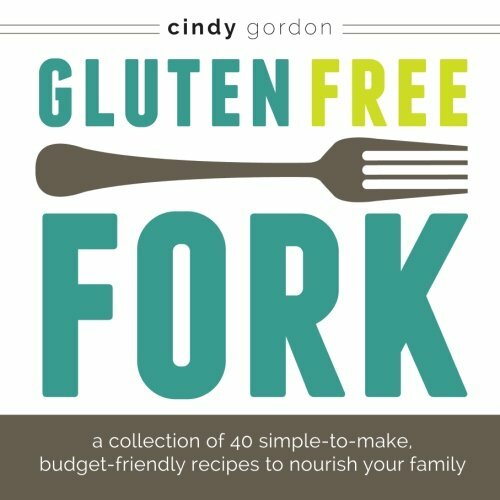 We used the EZ Tofu Press (affiliate ad link) for this recipe. As you know, we eat tofu quite often in our vegetarian household! Using a Tofu Press is a must when cooking with tofu! It helps to get all the excess liquid out to really enhance the overall flavor. New reader? 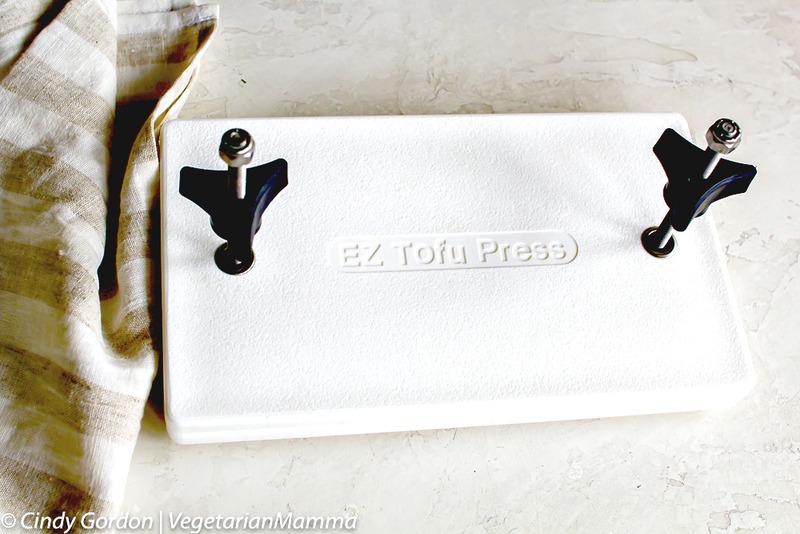 We would love to tell you more about why we LOVE our EZ Tofu Press! 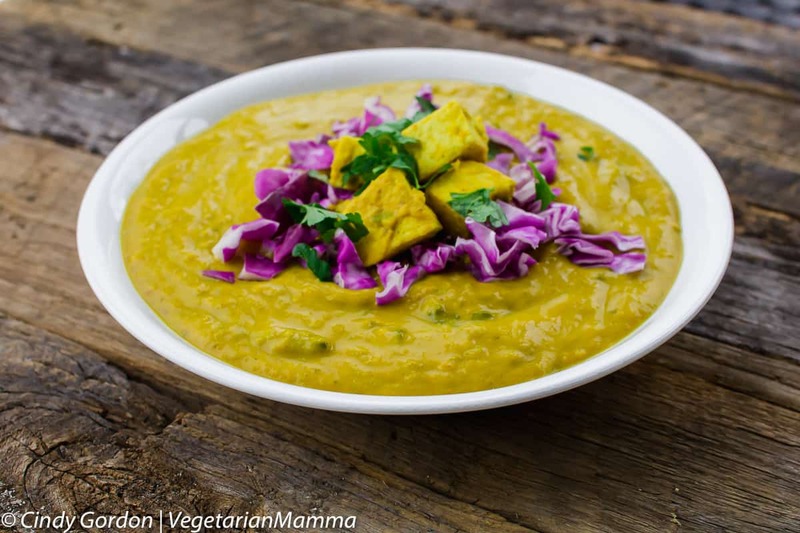 You may be wondering what makes this vegan or a vegetarian thai coconut curry soup? That is a great question! Many times this type of curry soup is made with chicken broth or fish sauce. This time, it is not. We used a vegetable broth to make this vegan and vegetarian friendly! *TIP* If you are vegetarian or vegan be sure to read the label of red curry paste. Often times, it contains a fishy ingredient. Take the soup ingredients and add to blender to make smooth, set aside. Sautee the tofu in a skillet until brown. Once brown, add to the soup. And just like that, you’ve created an amazing curry soup that tastes delicious. Totally simple, right? 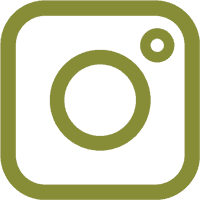 Can you make vegetable curry soup in the crock pot or IP? I haven’t tried this soup in my crockpot or instant pot yet (both affiliate ad links) But if I was guessing, I would say that you could make this in the crockpot on low with a 4-hour setting. Then I would add the tofu in at the end and cook for another 20 minutes. But that is just my guess! If you happen to try this thai soup in the crock pot or IP, please drop a comment telling me how it went! Now that you see how easy it is to make this Vegetarian Coconut Curry Soup, you’ll have no excuse not to make it for you and your family to enjoy. Once you start smelling all those Thai flavors combining so perfectly when cooking, you’ll be beyond ecstatic to take your first bite. And before you know what happened, your soup bowl will be empty and you’ll be begging for seconds! 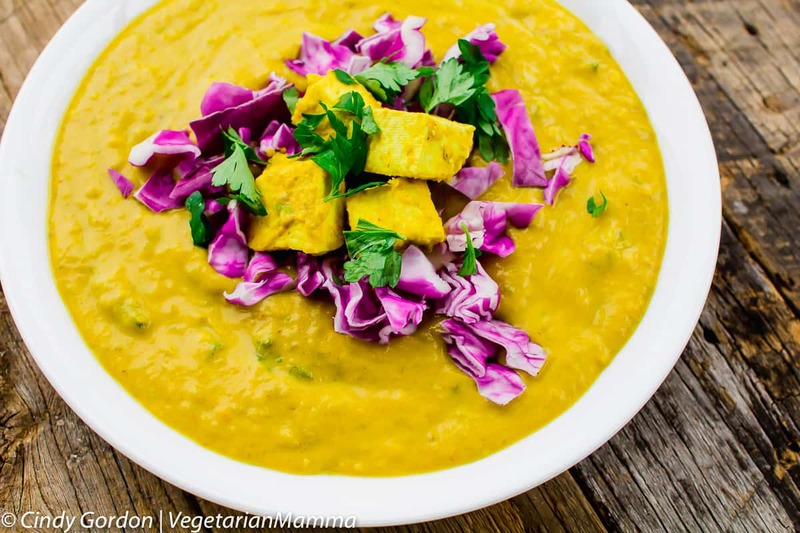 First, you are going to prep your tofu for this delicious coconut curry soup. Remove the tofu from the package, drain liquid. Insert tofu into the press. Tightening the handles gently and press tofu for 10-15 minutes, tightening every 4 minutes as necessary. Drain liquid, set tofu aside. In a large pot, over medium heat, warm the oil. Then saute the onion, ginger, leek, mushrooms, carrots, peas and cabbage. Next, add in the red curry paste, coconut milk, broth and potatoes. Bring to a boil, boil until potatoes are soft. Add kale to soup, let the heat from the soup, soften the kale. Using an immersion blender (or spoon hot soup into a blender) blend/pulse the mixture to make it smooth. In a skillet over medium heat, saute the tofu (cut it into bite sized pieces) until golden brown. When golden add the tofu to the blended soup. Garnish with more shredded cabbage and cilantro if you wish! ENJOY! We love this coconut milk soup and we hope that you enjoy it too! Let’s talk! Drop me a comment below telling me if you LOVE Thai Curry Vegetable Soup? Are you a fan? This looks so yummy! Thanks for posting. Now I’m craving curry! Coconut curries are my favorite. The shredding cabbage is such a beautiful touch for color and texture. Ha, sorry I got you hungry so long before lunch! ha! I love the cabbage on the top too! What a fantastic idea! What could be better? It looks incredible! Thank you! Thanks Marry, I agree it is fantastic! Coconut and curry are two of my most favorite flavors. I love the combo in this soup along with the added veggies. This soup looks amazing! Trying to integrate more vegetarian meals into my rotation. Thanks for throwing it into your rotation! The color of this soup is wonderful and I’m a big fan of Thai flavors, though hadn’t really thought about them being in 5 ‘groups’. Intrigued by tofu in soup, that’s a new one to me! 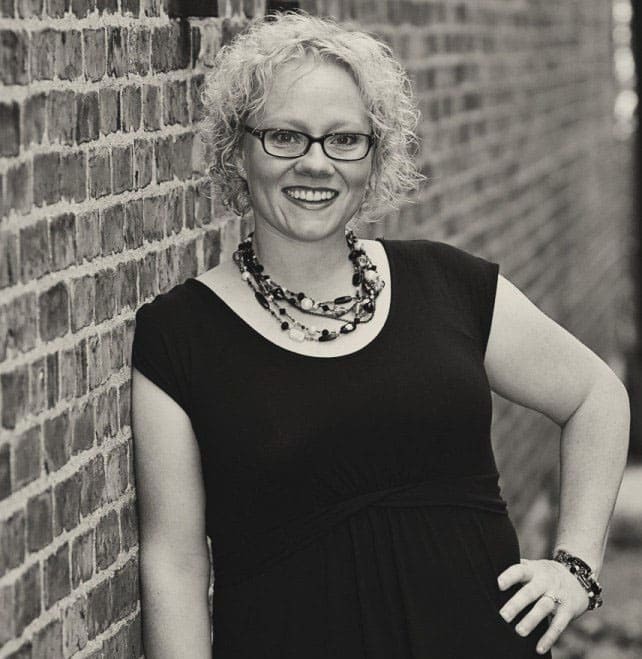 Thanks for stopping by Caroline! Yes the tofu adds a whole other layer of texture and depth! Delicious!